A wonderful plant for hanging baskets, for using as a ground cover beneath topiary or other plants, Pilea libanensis grows well in shade to part sun. It is the delicate rounded foliage that is the attraction and Pilea libanensis ‘Silver Sprinkles’ is one of the best forms available. The foliage itself is lightly flecked with silver, the stems are a mid red colour.A dense growth habit and an easy care nature make this a popular indoor plant. This is a plant that goes under a few names, simply ‘Silver Sprinkles’ and sometimes Pilea glaucophylla. 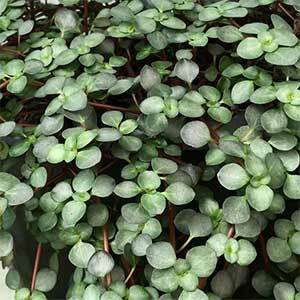 You may also like Pilea pepperomioides, the Chinese Money Plant. You will need a free draining potting mix and a position in good filtered light to get the most from this wonderful little plant. Watering need to monitored, wait until the soil begins to dry before watering, this will help eliminate fungal problems and rot. Avoid very cold positions and frost. Repot every 2 – 3 years in spring using a good quality potting mix. You can also propagate at this time by division of larger clumps. propagation is also possible from seed although this is very difficult to find. You can prune back any old or damaged growth at any time. In spring its time to to prune the plant back if it is getting to large or producing long and leggy growth. Pruning will encourage new fresh shoots and improve the overall look of the plant.